New York, NY (Monday, July 10, 2017) – Academy Award-winning filmmaker, best-selling author, and political icon Michael Moore begins rehearsals today for his thought-provoking and controversial Broadway debut in The Terms of My Surrender. 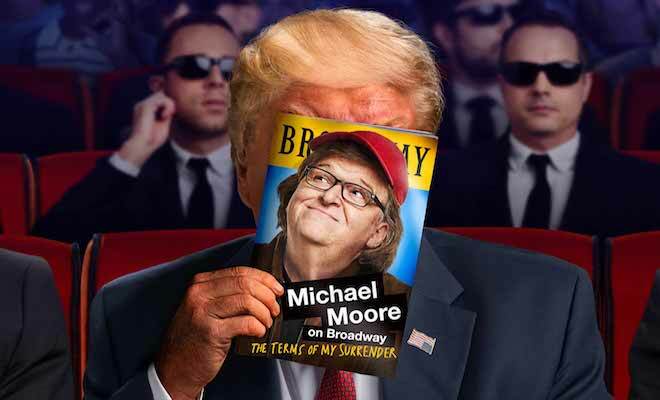 Directed by Tony Award-winner, Michael Mayer (Spring Awakening, American Idiot, Hedwig and the Angry Inch), Moore will be targeting President Trump using his signature political savvy and theatrical persona in this unique Broadway experience, taking place just down the street from Trump Tower and next door to George Orwell’s 1984 at The Hudson Theatre. The limited 12-week engagement will begin previews at Broadway’s Belasco Theatre (111 W 44th Street) on Friday, July 28, 2017 with an official opening night set for Thursday, August 10, 2017. The design team for The Terms of My Surrender includes a set by Tony Award-winner David Rockwell (Falsettos, She Loves Me), lighting design by four-time Tony Award-winner Kevin Adams (Hedwig and the Angry Inch, American Idiot), sound design by two-time Tony Award-winner Brian Ronan (Book of Mormon, Beautiful: The Carole King Musical), costumes by Tony Award nominee Jeff Mahshie (She Loves Me, Next to Normal), video and projection designs by Andrew Lazarow and movement direction by Noah Racey. The Terms of My Surrender is produced by IMG Original Content and Carole Shorenstein Hays. 101 Productions serves as Executive Producer. Tickets for The Terms of My Surrender are $29 – $149 and are available at Telecharge.com or by calling (212) 239-6200. During previews, performances are Monday – Saturday at 8 PM, Wednesdays and Saturdays at 2 PM (no matinee on 8/2/17). Regular performances are Tuesday – Thursday at 7 PM, Friday – Saturday at 8 PM, with 2 PM matinees on Wednesdays, Saturdays and Sundays.